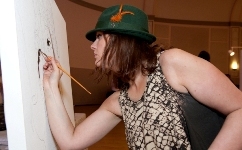 Inspiration Corporation’s annual art auction, One Inspired Evening is placing a call for artists! All proceeds from the event go to Inspiration Corporation. Inspiration Corporation serves over 3,000 individuals a year by providing meals, supportive services, housing, employment preparation and vocational training, and free voice mail – serving as a catalyst for self-reliance. There are three categories, established, emerging, and inspired. The winner from each category will win a cash prize.All submitted artwork will be curated and chosen by members of the Chicago arts community, photographer and business owner Steven E. Gross, artist and managing director of Firecat Projects Stan Klein and artist and founder/director of the Chicago Printmakers Collaborative Deborah Maris Lader. Any artist who submits work will receive a complimentary ticket to One Inspired Evening. This entry was posted in Call for Artists and tagged art, Call for Artists, Chicago, Chicago Printmakers Collaborative, Firecat Projects, Inspiration Corporation. Bookmark the permalink.